In order to update an application, the updated web resources of the application need to be packaged and uploaded to the MobileFirst Server using the MobileFirst CLI or by deploying a generated archive file. Direct Update is then activated automatically Once activated, it will be enforced on every request to a protected resource. 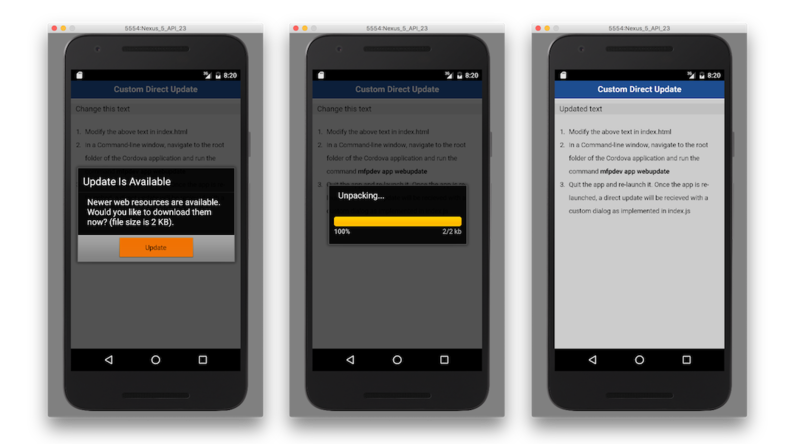 Direct Update is supported in the Cordova iOS and Cordova Android platforms. For development and testing purposes, developers typically use Direct Update by simply uploading an archive to the development server. While this process is easy to implement, it is not very secure. For this phase, an internal RSA key pair that is extracted from an embedded MobileFirst self-signed certificate is used. For the phases of live production or even pre-production testing, however, it is strongly recommended to implement secure Direct Update before you publish your application to the app store. Secure Direct Update requires an RSA key pair that is extracted from a real CA signed server certificate. Note: Take care that you do not modify the keystore configuration after the application was published, updates that are downloaded can no longer be authenticated without reconfiguring the application with a new public key and republishing the application. Without performing these two steps, Direct Update fails on the client. Learn more in Secure Direct Update. At optimal conditions, a single MobileFirst Server can push data to clients at the rate of 250 MB per second. If higher rates are required, consider a cluster or a CDN service. Direct Update updates only the application’s web resources. To update native resources a new application version must be submitted to the respective app store. When you use the Direct Update feature and the web resources checksum feature is enabled, a new checksum base is established with each Direct Update. If the MobileFirst Server was upgraded by using a fix pack, it continues to serve direct updates properly. However, if a recently built Direct Update archive (.zip file) is uploaded, it can halt updates to older clients. The reason is that the archive contains the version of the cordova-plugin-mfp plug-in. Before it serves that archive to a mobile client, the server compares the client version with the plug-in version. If both versions are close enough (meaning that the three most significant digits are identical), Direct Update occurs normally. Otherwise, MobileFirst Server silently skips the update. 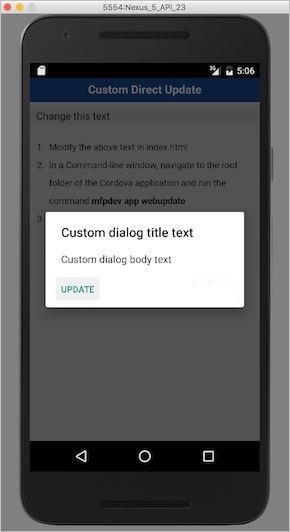 One solution for the version mismatch is to download the cordova-plugin-mfp with the same version as the one in your original Cordova project and regenerate the Direct Update archive. 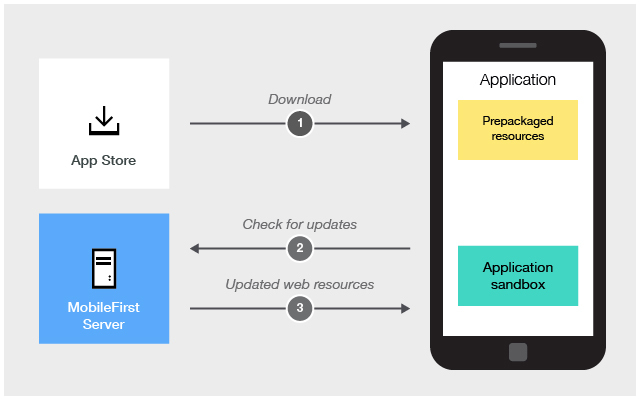 The application web resources are initially packaged with the application to ensure first offline availability. Afterwards, the application checks for updates on every request to the MobileFirst Server. Note: after a Direct Update was performed, it is checked for again after 60 minutes. After a Direct Update, the application no longer uses the pre-packaged web resources. Instead, it will use the downloaded web resources from the application’s sandbox. If the application’s cache on the device will be cleared, the original packaged web resources will be used again. A Direct Update applies only to a specific version. In other words, updates generated for an application versioned 2.0 cannot be applied to a different version of the same application. Once work on new web resources, such as bug fixes or minor changes and the like, is done, the updated web resources need to be packaged and uploaded to the MobileFirst Server. Run the command: mfpdev app webupdate. The mfpdev app webupdate command packages the updated web resources to a .zip file and uploads it to the default MobileFirst Server running in the developer workstation. The packaged web resources can be found at the [cordova-project-root-folder]/mobilefirst/ folder. 2. Load the MobileFirst Operations Console and click on the application entry. 3. Click on **Upload Web Resources File** to upload the packaged web resources. Run the command mfpdev help app webupdate to learn more. By default, after a Direct Update is received a dialog is displayed and the user is asked whether to begin the update process. After the user approves a progress bar dialog is displayed and the web resources are downloaded. The application is automatically reloaded after the update is complete. The default Direct Update UI that is presented to the end-user can be customized. directUpdateData - A JSON object containing the downloadSize property that represents the file size (in bytes) of the update package to be downloaded from MobileFirst Server. If the web resources are newer on the MobileFirst Server than in the application, Direct Update challenge data is added to the server response. Whenever the MobileFirst client-side framework detects this direct update challenge, it invokes the wl_directUpdateChallengeHandler.handleDirectUpdate function. The function provides a default Direct Update design: a default message dialog that is displayed when a Direct Update is available and a default progress screen that is displayed when the direct update process is initiated. You can implement custom Direct Update user interface behavior or customize the Direct Update dialog box by overriding this function and implementing your own logic. In the example code below, a handleDirectUpdate function implements a custom message in the Direct Update dialog. Add this code into the www/js/index.js file of the Cordova project. navigator.notification.confirm(  // Creates a dialog. You can start the Direct Update process by running the directUpdateContext.start() method whenever the user clicks the dialog button. The default progress screen, which resembles the one in previous versions of MobileFirst Server is shown. When no parameters are specified, the MobileFirst Server uses the default progress screen. onStart is called with the totalSize parameter that holds the size of the update file. onProgress is called multiple times with status DOWNLOAD_IN_PROGRESS, totalSize, and completedSize (the volume that is downloaded so far). onProgress is called with status UNZIP_IN_PROGRESS. SUCCESS Direct update finished with no errors. CANCELED Direct update was canceled (for example, because the stop() method was called). FAILURE_NETWORK_PROBLEM There was a problem with a network connection during the update. FAILURE_DOWNLOADING The file was not downloaded completely. FAILURE_NOT_ENOUGH_SPACE There is not enough space on the device to download and unpack the update file. FAILURE_UNZIPPING There was a problem unpacking the update file. FAILURE_ALREADY_IN_PROGRESS The start method was called while direct update was already running. FAILURE_INTEGRITY Authenticity of update file cannot be verified. If you implement a custom direct update listener, you must ensure that the app is reloaded when the direct update process is complete and the onFinish() method has been called. You must also call wl_directUpdateChalengeHandler.submitFailure() if the direct update process fails to complete successfully. 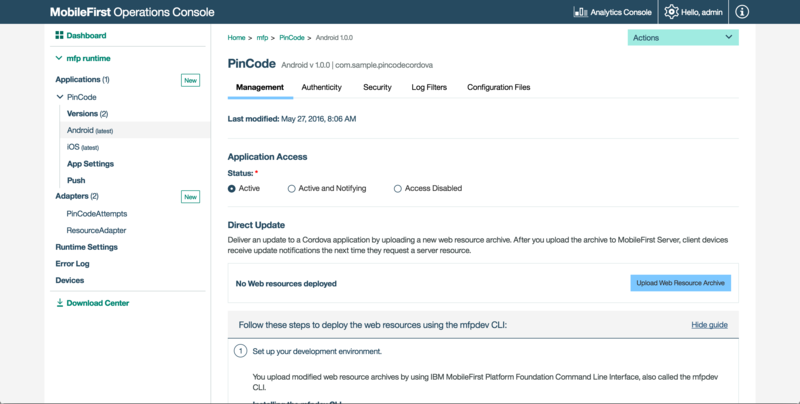 IBM Mobile Foundation supports UI-less direct update when the application is in the foreground. To run UI-less direct updates, implement directUpdateCustomListener. Provide empty function implementations to the onStart and onProgress methods. Empty implementations cause the direct update process to run in the background. The onFinish method can be empty as well. In this case, direct update will apply after the application has restarted. The onFinish method can enforce a reload of the application by calling WL.Client.reloadApp(). Note: When the application is sent to the background, the direct-update process is suspended. This scenario shows how to handle a direct update failure that might be caused, for example, by loss of connectivity. In this scenario, the user is prevented from using the app even in offline mode. A dialog is displayed offering the user the option to try again. When the user clicks the Try Again button, the application restarts the direct update process. Delta Direct Updates enables an application to download only the files that were changed since the last update instead of the entire web resources of the application. This reduces download time, conserves bandwidth, and improves overall user experience. Important: A delta update is possible only if the client application’s web resources are one version behind the application that is currently deployed on the server. Client applications that are more than one version behind the currently deployed application (meaning the application was deployed to the server at least twice since the client application was updated), receive a full update (meaning that the entire web resources are downloaded and updated). Disabled by default, Secure Direct Update prevents a 3rd-party attacker from altering the web resources that are transmitted from the MobileFirst Server (or from a Content Delivery Network (CDN)) to the client application. Using a preferred tool, extract the public key from the MobileFirst Server keystore and convert it to base64. Run the command: mfpdev app config and select the “Direct Update Authenticity public key” option. Provide the public key and confirm. Any future Direct Update deliveries to client applications will be protected by Direct Update authenticity.